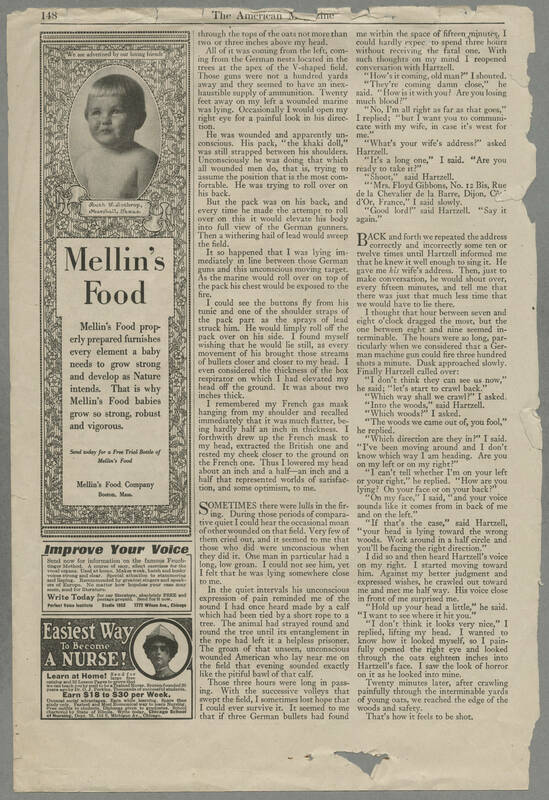 148 The American Magazine "We are advertised by our loving friends" Ruth F. Lothrop Marshall, Texas Mellins Food Mellin's Food properly prepared furnishes every element a baby needs to grow strong and develop as Nature intends. That is why Mellin's Food babies grow so strong, robust and vigorous. Send today for a Free Trial Bottle of Mellin's Food Mellin's Food Company Boston, Mass. Improve your Voice Send now for information on the famous Feuchtinger Method. A course of easy, silent exercises for the vocal organs. Used at home. Makes weak, harsh and husky voices strong and clear. Special attention to stammering and lisping. Recommended by greatest singers and speakers of Europe. No matter how hopeless your case may seem, send for literature. Write Today for our literature, absolutely FREE and postage prepaid. Send for it now. Perfect Voice Institute Studio 1053 1772 Wilson Ave., Chicago Easiest Way to Become a Nurse Learn at Home! Send for large free catalog and 32 Lesson Pages to prove that we can teach you by mail to be a Trained Nurse. System founded 20 years ago by Dr. O. J. Perkins. Thousands of successful students. Earn $18 to $30 per Week. Unusual social advantages. Earn while learning. Spare time study only. Fastest and Most Economical way to learn Nursing. Free outfits to students. Diplomas given to graduates. School chartered by State of Illinois. Write today. Chicago School of Nursing. Dept. 73, 116 S. Michigan Av., Chicago Though the tops of the oats not more than two or three inches above my head. All of it was coming from the German nests located in the trees at the apex of the V-shaped field. Those guns were not a hundred yards away and they seemed to have an inexhaustible supply of ammunition. Twenty feet away on my left a wounded marine was lying. Occasionally I would open my right eye for a painful look in his direction. He was wounded and apparently unconscious. His pack, "the khaki doll," was still strapped between his shoulders. Unconsciously he was doing that which all wounded men do, taht is, trying to assume the position that is the most comfortable. He was trying to roll over on his back. But the pack was on his back, and every time he made the attempt to roll over on this it would elevate is body into full view of the German gunners. Then a withering hail of lead would sweep the field. It so happened that I was lying immediately in line between those German guns and this unconscious moving target. As the marine would roll over on top of the pack his chest would be exposed to the fire. I could see the buttons fly from his tunic and one of the shoulder straps of the pack part as the sprays of lead struck him. He would limply roll off the pack over on his side. I found myself wishing that he would lie still, as every movement of his brought those streams of bullets closer to my head. I even considered the thickness of the box respirator on which I had elevated my head off the ground. It was about two inches thick. I remembered my French gas mask hanging from my shoulder and recalled immediately that it was much flatter, being hardly half an inch in thickness. I forthwith drew up the French mask to my head, extracted the British one and rested my cheek closer on the ground on the French one. Thus I lowered my head about an inch and a half that represented worlds of satisfaction, and some optimism, to me. Sometimes there were lulls in the firing. During those periods of comparative quiet I could hear the occasional moan of other wounded on that field. Very few of them cried out, and it seemed to me that those who did were unconscious when they did it. One man in particular had a long, low groan. i could not see him, yet I felt that he was lying somewhere close to me. In the quiet intervals his unconscious expression of pain reminded me of the sound I had once heard made by a calf which had been tied by a short rope to a tree. The animal had strayed round and round the tree until its entanglement in the rope had left it a helpless prisoner. The groan of that unseen, unconscious wounded American who lay near me on the field that evening sounded exactly like the pitiful bawl of that calf. Those three hours were long in passing. With the successive volleys that swept the field, I sometimes lost hope that I could ever survive it. It seemed to me that if three German bullets had found me within the space of fifteen minutes. I could hardly expect to spend three hours without receiving the fatal one. With such thoughts on my mind I reopened conversation with Hartzell "How's it coming, old man?" I shouted. "They are coming damn close, " he said. "How is it with you? Are you losing much blood?" "No, I'm all right as far as that foes," I replied; "But I want to communicate with my wife, in case it's west for me." "What's your wife's address?" asked Hartzell. "It's a long one," I said. "are you ready to take it?" "Shoot," said Hartzell. "Mrs. Floyd Gibbons, No. 12 Bis, Rue de la Chevalier de la Barre, Dijon, Cote d'Or, France," I said slowly. "Good Lord!" said Hartzell. "Say it again." Back and forth we repeated the address correctly and incorrectly some ten or twelve times until Hartzell informed me that he knew it well enough to sing it. He gave me his wife's address. Then, just to make conversation, he would shout over every fifteen minutes, and tell me that there was just that much less time that we would have to lie there. I thought that hour between seven and eight o'clock dragged the most, but the one between eight and nine seemed interminable. The hours were so long, particularly when we considered that a German machine gun could fire three hundred shots a minute. Dusk approached slowly. Finally Hartzell called over: "I don't think they can see us now," he said; "let's start to crawl back." "Which way should we crawl?" I asked. "Into the woods," said Hartzell. "Which woods? I asked. "The woods we came out of, you fool," he replied. "Which direction are they in?" I said. "I've been moving around and I don't know which way I am heading. Are you on my left or on my right?" "I can't tell whether I'm on your left or your right," he replied. "How are you lying? On your face or on your back?" "On my face," I said, "and your voice sounds like it comes from in back of me and on the left." "If that's the case," said Hartzell, "your head is lying toward the wrong woods. Work around in a half circle and you'll be facing the right direction." I did so and then heard Hartzell's voice on my right. I started moving toward him. Against my better judgement and expressed wishes, he crawled out toward me and met me half way. His voice close in front of me surprised me. "Hold up your head a little," he said. "I want to see where it hit you." "I don't think it looks very nice," I replied, lifting my head. I wanted to know how it looked myself, so I painfully opened the right eye and looked through the oats eighteen inches into Hartzell's face. I saw the look of horror on it as he looked into mine. Twenty minutes later, after crawling painfully through the interminable yards of young oats, we reached the edge of the woods and safety. That's how it feels to be shot.